The coastal National Park boats some of the best Australian Beaches and showcases amazing temperate forest, wildlife at every tern and a quite almost undiscovered atmosphere, making for an amazing place to enjoy. Throughout this 3 day journey you will experience the Parks highlights through mixed transport means. Hike easy or challenging coastal trails and beaches dotted with rainforest, expansive coastal views and great spots to enjoy lunch and a swim. 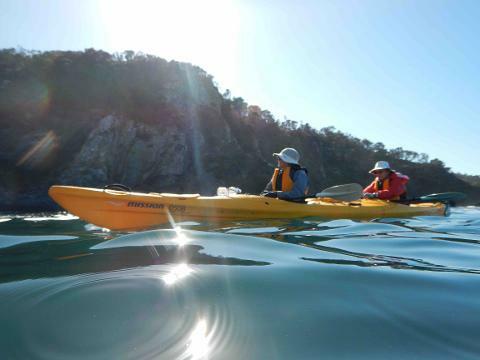 Sea Kayak amazing coastal sections of the park visiting ancient geological features, quiet coves, round the islands and experience remote beaches. Snorkel and try your hand at collecting coastal seafood for your evening feast! The tour is suitable for local and international travellers. The guide team can tailor the intensity of the chosen route to match the groups ability and desire, including options for kids. Spanning 44km of dramatic coastline, Murramarang National Park is the ultimate spot to soak up some sun and explore the cliffs, headlands and pristine beaches of the NSW south coast. Be sure to pack your swimmers to hit the surf, your binoculars to spot peregrine falcons and sea eagles that soar high above the cliffs and even try to catch your dinner. It’s a great place to spend a few days or a week ! Day Prior to your Tour - We strongly recommend you arrive the day prior, we can offer Airport Pickups. Travellers will be met by a Region X staff at the Canberra International Airport. You will be transferred via comfortable air conditioned transport to Murramarang National Park. The road journey includes a few stops to check out the local sites and grab some lunch. The area surrounding Canberra has a rich Pastoral Settlement history before the Great Dividing Range - Australia’s Longest mountain range steeply falls away to the East Coast. 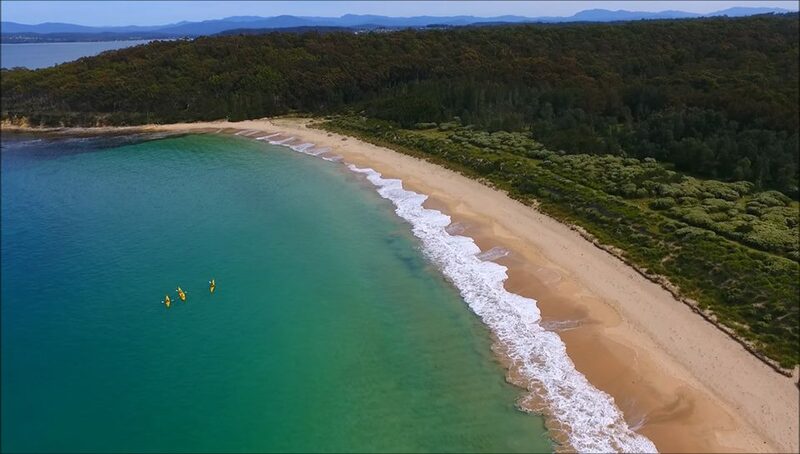 The temperate forest here showcases various waterways prior to arrival in Batemans Bay, a historic timber village now a popular seaside holiday destination. You can choose to check into your National Park accommodation by adding another night or a Batemans Bay Hotel (not included in tour price) Here you will meet the rest of the guide team and be settled into your Cabin accommodation in the heart of Murramarang National Park just north of Batemans Bay, a great base to explore from. While lazy Eastern Grey Kangaroos sleep on your lawn, settle in and enjoy a beach walk to stretch your legs before the evening meal. Note: The above is not Included in Tour price. Day 2 - Sea Kayaking. The best part about sea kayaking is getting to remote locations and thats what we do! The most inaccessible stretch of the park lies north of your cabins and offers the best sea kayaking opportunities. We use double expedition style sea kayaks and load up our lunch and swimmers for a day out exploring isolated beaches and islands. If you lucky spot dolphins and whales and put up the sails for an afternoon sail back to camp. In the evening take a guided spotlight walk to find Possums and Powerful Owls. Included: Breakfast, Lunch, Dinner. 3 nights Accommodation on nights 1, 2 & 3. Twin share basis at Murramarang National Park Beach Cabins. All meals from Dinner Day 1 to Breakfast Day 4 including an evening restaurant meal in Batemans Bay. All necessary Permits and Licences to enter the National Park. Transfers to and from Canberra or Sydney Airport before and after your tour - You will need to provide us with your arrival and departure details if you would like a pickup service.